After six years, our sideyard has gone from desolate grassy plain to bountiful display of mass adoptions from the nursery. As of May 2011 (above), it was beginning to look as overstuffed as our initial 2005 mockup of nursery catalog photos (below). 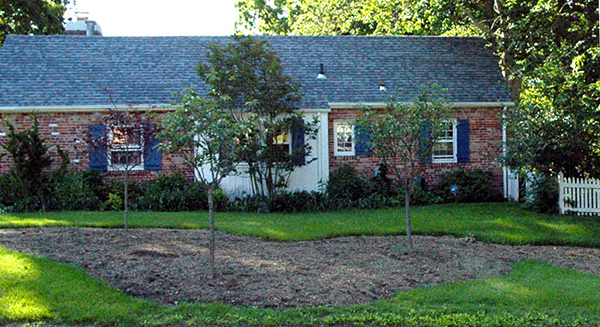 The white crape myrtle in the plan at right has grown even bigger than shown in the plan, though it doesn’t appear in the photo because it doesn’t bloom until August. 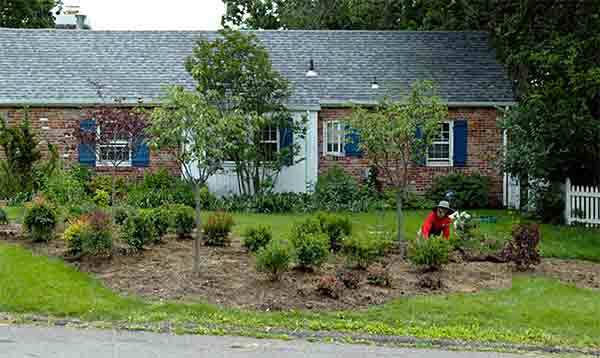 The photo does show an equally bodacious Snowmound Spirea, at front center, contributing a hot-white hedge that contrasts with a shorter patch of deep purple salvia in front. There’s plenty of color despite some disappointments. Two pink cherry trees in the plan fell victim to poor drainage within months, but the added redbud and a preexisting crape myrtle against the house bring magenta to the scene. Likewise, a series of bright-red dwarf crape myrtles have been stunted by inadequate sun, we think, but at front left we added a smoke bush with a red-brown halo of “smoke” and charmingly round purple leaves. 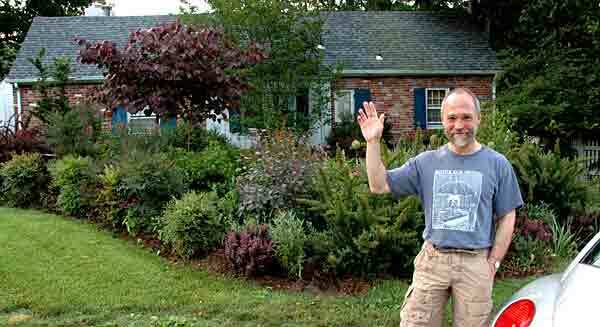 May 2005 (below): Richard started the bed by killing the lawn with plastic tarps and having it rototilled before the nursery planted the two doomed pink cherries. 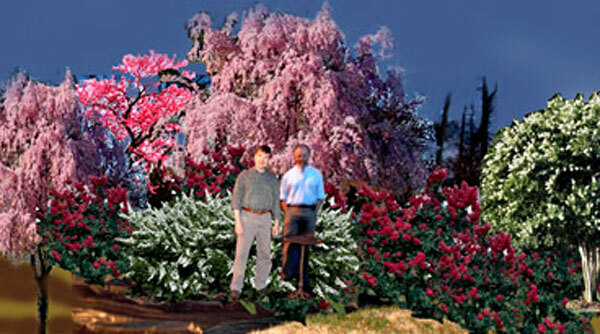 My hope for starting a cherry-blossom festival along 31st Street died with those saplings. From the start, a meandering row of waist-high inkberry hollies has been the evergreen spine of the wide bed year ’round. The dark red sand cherry bush at right hasn’t done as well. By 2007, the bed is maturing and undergoing major changes. Two cherries are gone, probably victims of poor drainage, and RIchard has dug out clay to reduce that problem. At front left, we added red barberries and nandinas, plus the smoke bush, which we transplanted from a shadier area.